Tai Ji, a form of martial art, originates from ancient China. It is practiced throughout the world as an effective exercise for health. Tai Ji consists of fluid, gentle movements that are relaxed and slow in tempo. It can be practiced almost anywhere and is a suitable form of exercise for just about anyone. The moving meditation of Tai Ji integrates mind and body and spirit. It helps build balance and coordination, improve mental acuity and strengthen the mind/body connection. According to the British Journal of Sports Medicine, Tai Ji helps improve metabolic rate, heart rate, blood pressure, oxygen uptake, immune capacity, and fall prevention. Tai Ji classes are movement oriented with a mix of body alignment/awareness, Qi Gong integrated breathing exercises, Tai Ji principles and Tai Ji forms. The TRX Suspension Trainer is the original, best-in-class workout system that leverages gravity and your bodyweight to perform hundreds of exercises. TRX is a suspension training class which allows participants to work against their weight to improve strength, balance, flexibility and joint stability. TRX is a good tool to help both beginner to advanced yoga practitioners get more closely in touch with their bodies and explore different types of yoga poses. TRX aids in alignment and lets your body learn how a pose should feel. It offers different challenges and different assistance at the same time! Just like traditional yoga props such as blocks or bolsters, the TRX trainer can be used to support and enhance many poses. Because you are partially suspended, TRX develops muscle strength and helps build confidence for poses that be difficult or scary. Can’t balance on one leg for tree pose? TRX can help! Headstands sound terrifying? Not a problem! For the more experienced yogi, a TRX strap can introduce more play into your practice, as it assists you in safely working toward challenging poses like inversions, arm balances and backbends that may seem scary or complex in a normal yoga studio setting. TRX should be used as a cross-training tool for a normal yoga practice. High intensity interval training (HIIT) techniques like tabata intervals are used to supercharge your TRX Suspension Training workouts. The basic HIIT technique is to alternate periods of extremely high intensity exercise with short rest periods for a specified number of sets. Vinyasa is a unique style of yoga where postures are linked together in a continuous, challenging and creative flow that combines strength and flexibility while toning the body and clearing the mind. Students are encouraged to move at their own pace with intention and to listen to their body as they explore their own edge and discover inner strength. Students will focus on linking conscious breath with a vigorous and mindful flow. Slow Flow yoga is an all levels class that breaks down the fundamentals of a yoga practice. A vinyasa flow class that incorporates longer holds and slower movements. We take it slowly and intentionally, shedding light on foundational yoga poses and taking the time we need to feel them and understand them fully. Lunch Flow helps you enjoy a break from your work day and rebuild your energy level during your lunch time. This 45-minute class will stretch, invigorate, and relax you to help you get through the rest of your day. Yoga Foundations will introduce and explore key foundational poses of classical yoga with an emphasis on integral alignment and breath with movement. Whether you are newer to yoga, returning, or building a consistent practice, the 'fun'damentals of yoga are helpful for ease of movement and mind. 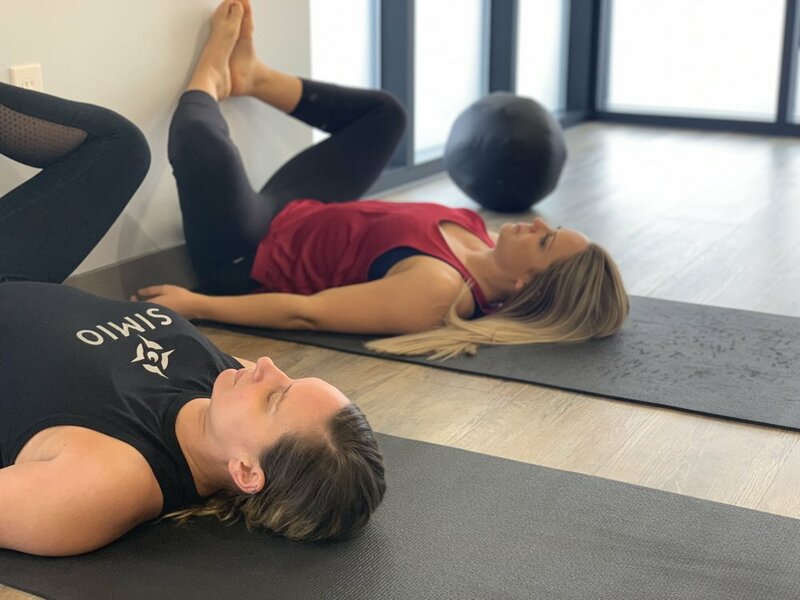 CORE Flow combines traditional core exercises with a vinyasa flow yoga class to create the increased strength and flexibility needed to improve your yoga practice and your overall health. The class will focus on exercises to keep the core strong and stable which will improve posture alignment and breathing capacity. This the class will focus on yoga movements to increase flexibility, build strength, improve balance, and reduce stress. This class alternates between intense bursts of activity and periods of less-intense movement. These workouts will help to build cardiovascular fitness while also improving strength, building lean muscle and maximizing calorie burn. You will love the results! This class is designed to build core muscle groups while improving posture through performing a variety of exercises that strengthen the abdomen and back muscles and increase flexibility. The instructor may include a variety of equipment in this great workout.